Play multiplayer games on PS4, no subscription required. Sony announced today that it will hold a free multiplayer weekend on PlayStation 4, which is scheduled to begin this Friday. 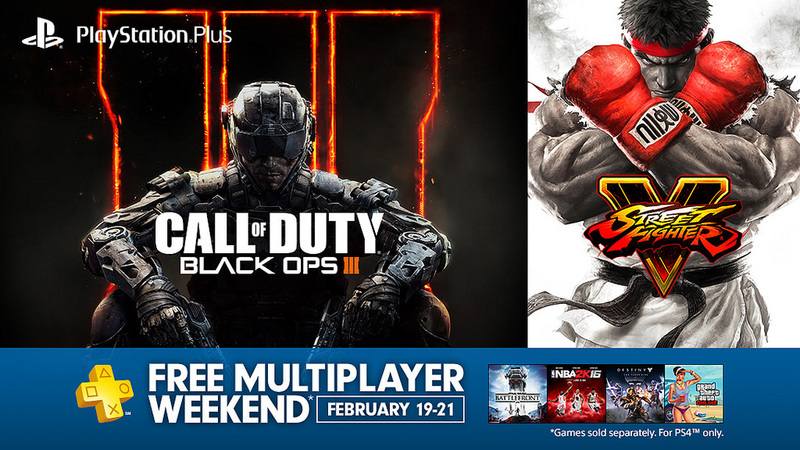 Over the course of the weekend, all players will be able to access multiplayer options for any PlayStation 4 game for free, no PlayStation Plus subscription required. While the highlight of the announcement was newly released Street Fighter V, Sony also encouraged users to try out Call of Duty: Black Op 3, as well as the new DLC, Awakening. The free multiplayer weekend launches Friday, February 19 at 12:01am PT, and will run through Sunday, February 21, at 11:59pm PT. Street Fighter V released on February 16 on PlayStation 4 and PC. You can read The Escapist's review here.